Models pose backstage at the By Misha “Crown Jewels” A/W 2012 Presentation. 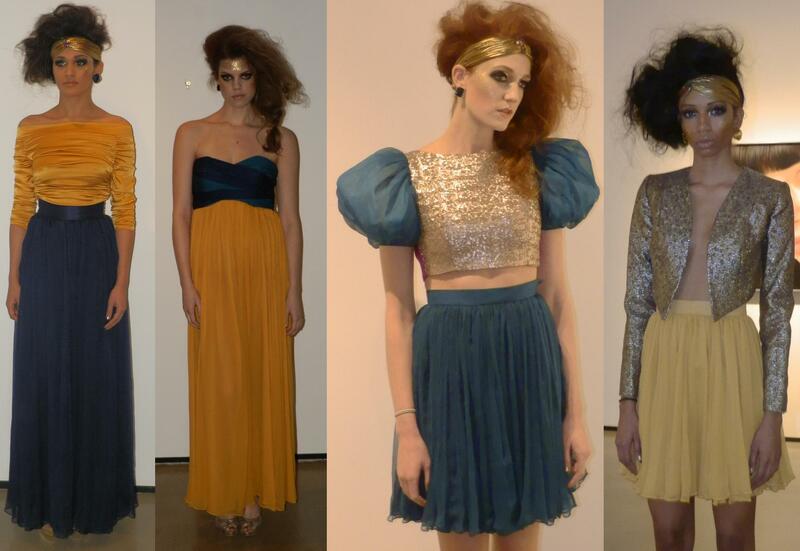 On February 10th I attended the A/W 2012 Presentation of emerging London fashion designer Misha Vaidya, who presented her fairytale-inspired collection, Crown Jewels, for her line By Misha. Guest were swept away into an enchanted land as statuesque models emerged in bedazzling pieces, complemented by loose, flowing waves and whimsical makeup. Makeup by Nina Arce (Nina’s Makeup), Hair by Privé Salon and Nails by Martier Spa. Smoldering, dark, smoky eyes created a dramatic, sensual look. The hair on all the models were big, loose, and flowing, adding to the fantasy feel of the “Crown Jewels” collection. Gold headbands were placed low on the forehead, and gold face glitter illuminated the skin of the models. The collection drew inspiration from storybook fairytales, and featured romantic ruffles, dreamy free-flowing chiffon and adventurous embellishments. Even when the models weren’t moving the clothing looked like they were delicately floating in the air, as they softly clung onto the contours of the figures they were draping. The base colors of most of the garments were black and gold, and featured rich jewel tones, emerald, fuchsia, purple, mustard, turquoise and royal blue.